With its rugged terrain, picturesque remote villages and fascinating history, it’s important to remember that Gran Canaria is more than just a beach destination. A rich and varied history awaits you, with a plethora of historic attractions, as well as a diverse and multifaceted culture. There is ample opportunity to discover much about Gran Canaria during your stay here, and once you’ve sorted out transportation (which you can do at this link), you can start planning what would be best to see. For now, we’ll just outline our personal favourite aspects about the island’s culture and archaeology to whet your appetite. Gran Canaria is a world of contrasts – of seemingly opposing aspects that somehow complement one another. Where else can you explore an incredible old gothic church and then venture outside into a banana plantation? Or stumble into the ruins of a pre-Hispanic city just two steps away from the market? The joy of exploring the island by yourself is that you can enjoy these experiences on a spontaneous basis. There are plenty of historical relics to discover from cultures across the world. Gran Canaria was once a gigantic crossroads for the international shipping trade, and so sailors from many different countries have been able to make their mark on it over time. The remote picturesque villages are a particular highlight. 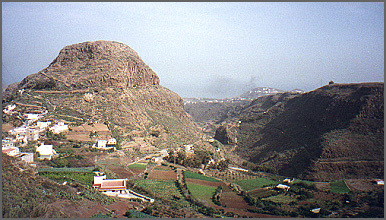 Make time to visit Tejeda – it may be high in the mountains but its beautiful collection of churches and historic attractions is second to none. Likewise, the town of Arucas is dominated by a neo-gothic style of architecture that has been impressing visitors for centuries. Puerto de las Nieves is a little fishing village – visit here for excellent seafood cuisine, the freshest you can get. If you’re interested in exploring the activities of Gran Canaria’s ancient inhabitants, you’re in for a treat. The island is said to have been blessed with the most complete ruins of past civilisations of all its Canary equivalents. It counts caves painted with indigenous Canarian artwork among its sites of historical interest, as well as the enormous burial area of Maipes Archaeological Park, which stretches onwards with a surface of over one square kilometre. The caves of Tunte, however, hide evidence of the living – this large underground settlement comprises an entire village complete with dwellings, granaries and rupestrian paintings. It is absolutely fascinating to wander through. You’ll find ancient constructions out in the open too, such as those of La Restinga, which were supposedly used for grain storage by the first inhabitants of Gran Canaria. For an informed education on the island’s history, head to one of its many museums. The Museo de la Zafra offers a striking look into the traditional agricultural way of life led in the local area, while Salines de Tenefe gives a surprisingly informative indication of why salt has been so historically important to the island. Failing that, head to Casa de Colon – the House of Columbus – which celebrates Gran Canaria’s role in the discovery of America and its central position in the international trade network.